There are several pirate table-top games out there, and many of them are quite good. But few conjure a feeling of old-world piracy so effectively as Dread Pirate from Front Porch Classics. Packaged in a real wooden chest, from the moment you remove its contents of metal doubloons, glass jewels, and even a cloth playing “board”, every aspect of this game seems as though it were stolen straight from the captain’s cabin. It’s as if it were specifically designed to be played over rum by candlelight – preferably while a storm wages outside. 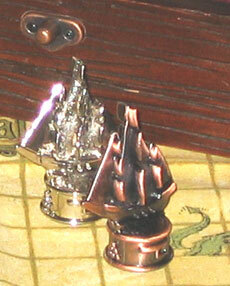 In Dread Pirate 2-4 players, represented by ship figures cast from varying metals, compete to collect as many doubloons and jewels as possible from a series of islands, and from each other. Along the way players have the opportunity to draw fate cards, resulting in surprises both good and bad (and sometimes terribly ugly.) 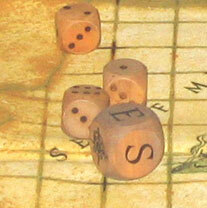 Gameplay and combat are both simple and effective, represented by the roll of wooden dice. The beauty of Dread Pirate is in its simplicity. After the first few rounds, gameplay, though full of options and possibilities, becomes fairly second nature. This makes for a very relaxed and social game, as players’ brainpower is free to engage in shouts of encouragement, good natured heckling, and of course the occasional “yarrr!! !” Dread Pirate also has a very open tone about it, allowing the evening to become as silly or serious as your own party sees fit. With it’s gorgeous craftsmanship and straighforward gameplay, Dread Pirate could easily become the centerpiece of your coffee table and the cornerstone of your pirate gatherings. It comes with a fairly hefty price-tag, but the quality of this product easily make it money well spent. As an aside, this game is also available in a smaller, less expensive, but apparently equally well made bookshelf edition. See the Front Porch Classics website for details. This entry was posted in Games and tagged bilgemunky's favorites, front porch classics by Bilgemunky. Bookmark the permalink. I’m afraid I must disagree here. The game, even the bookshelf edition, which was given to me as a gift, is gorgeous. The components are very well made and very nice to behold. However, the game is drop-dead boring. It isn’t really even a game so to speak. 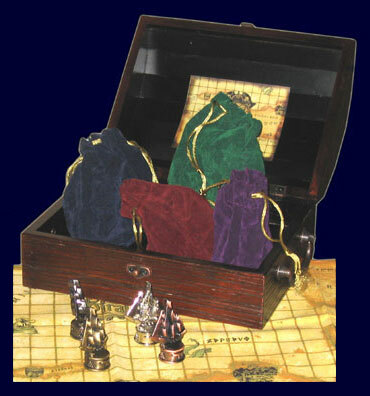 Roll and move your ship, and roll a random die to steal stuff from others. It has no depth at all, and my group couldn’t even finish the first game we tried– it was that bad. If you’re in the market for some nice pirate doubloons then it might be worth the high price. But as a game, it’s an utter failure. Wow you got it right this game is truly a great family game. I have been collecting these games from FRONT PORCH CLASSIC for many years now. 1. if you roll doubles you move again and we play a round of Liers die. The person who rolled the double places the bet. I fyou drop out you must skip a turn or pay 3 coins. Just to let anyone know if they’re looking for cheap piratey xmas gifts. I just picked up this edition of Dread Pirate for $20 bucks at Ollies. They must have bought out a game store. So if you have an Ollies around check out their boardgame section.